The Palais Impérial de la Bourse (Imperial Palace of the Stock Exchange) was conceived by Napoleon as part of a wider political and architectural program. Upon his coming to power with the coup of 18 Brumaire, Napoleon was determined to rebuild the political institutions of France which had for a decade been shaken by Revolution. His changes and repackagings were also fundamental in repairing the domain of economy and finance; indeed many of the organizations he created would stand the test of time. He established the Banque de France (Bank of France) on 13 February 1800, which would hold the monopoly of the issuing of banknotes (from April 1807), re-instated commodity markets (9 March 1801), reorganized professions such as those of brokers and dealers (19 March 1801), installed 22 chambers of commerce (24 December 1802) established bimetallism (7 April 1802), edited a Commercial Code on 10 September 1807 and created the Cour des Comptes (Court of Auditors) on 16 September 1807. In order to facilitate surveillance (performed on a daily basis by a police commissioner) and in the interests of efficiency, it was deemed necessary to end the peripatetic nature of finacial trading and to choose a unique and appropriate location. Between 1794 and 1807, the Imperial Bourse had been accommodated at the Louvre, the Palais-Royal, as well as in the deconsecrated church of the Petits-Pères (now Notre-Dame des Victoires). Henceforth the Bourse (or stock exchange) was to sit proudly as part of the urban landscape of the capital in a building erected in the enclosure of the Filles-St Thomas (Decree of 15 March 1808). The choice of this location was not insignificant: it was within the same business district as where the Banque de France was being established near the Place des Victoires. The new building was to be given more prestige by being built on an independent plot of land, and it was designed to look like an ancient temple, both simple and elegant. Thus, following the taste of the Emperor, this new “Temple of Commerce” was to form an iconic monumental triptych, together with the “Temple of Glory” (which would later become the Eglise de la Madeleine), and the “Temple of the Law”, (a Bourbon palace whose façade was decorated with an antique-style colonnade by Bernard Poyet (1742-1824)). Alexandre-Théodore Brongniart (1739-1813) was chosen as the architect of what would become – in the words of Pierre Fontaine, Napoleon’s favourite architect – “one of the finest and most important monuments of this reign”. 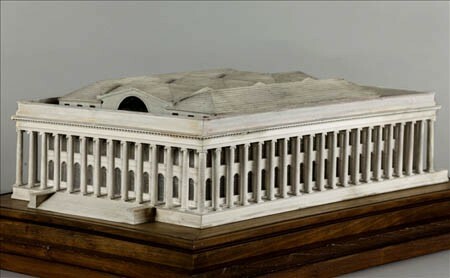 Brongniart’s design, inspired by the temple of Vespasian and Titus (built in Rome c. 80 AD) and the “Maison Carrée” (literally “Square house” but in fact a Roman temple) in Nîmes, resembled a Peripteros [type of ancient Greek or Roman temple surrounded by a portico with columns], in the Corinthian style. This scale-model by the modeller Jean-Pierre Fouquet, was presented at the 1808 Salon and shows a different project from the one that was actually realised. Moreover, Brongniart had plans to create a square in front of the stock market building, delimited by a colonnade. The entrance to the square was to be via two monumental gates opposite the rue Vivienne: a drawing (now held at the Musée Carnavalet in Paris) gives a vision of the ensemble. 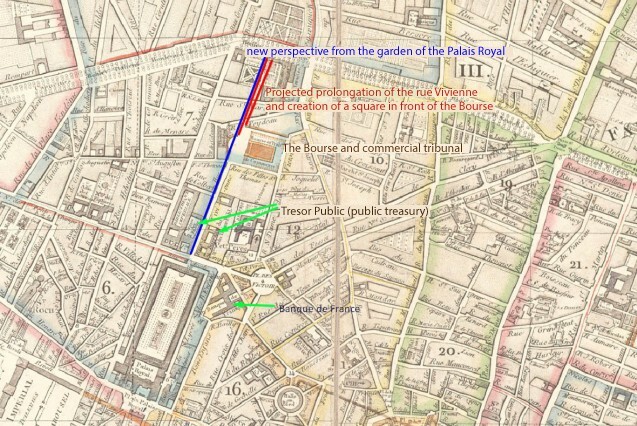 Finally, the Rue Vivienne itself was intended to be extended northwards, in this way extending from the Palais Royal in the South as far as the Boulevard Montmartre. On 1 January 1812, construction of the building had been completed only as far as the stylobate, and, of the estimated 6 million needed, just under 1.7 million had already been spent. When Brongniart died in 1813, Eloi Labarre (1764-1838) was assigned the task of completing the project. The work was interrupted in 1815 and started again in 1821. The Palais de la Bourse was inaugurated on 4 November 1826 by the Préfet de la Seine, Chabrol. It was also home to the Tribunal de Commerce (Commercial Tribunal), previously installed in rue Saint-Meri, and the Chamber of Commerce, which had been located at the Hôtel de Ville (town hall) since its creation in 1803. Four statues were added to the corners in 1851 and extensions were added, led by Jean-Baptiste-Frédéric Cavel, between 1902 and 1907, transforming the original plan into a Latin cross. A glass roof was also added as well as cast-iron railings all around. Since 1987 the building has been registered as a historic monument. This model was presented in the exhibition “Napoleon and Paris, dreams of a capital” at the Musée Carnavalet (from 8 April to 30 August 2015).